SOCHI, May 22. /TASS/. The number of Earth observation satellites is set to be no less than 15 by 2020, Russian President Vladimir Putin said at a meeting on the space sector’s development on Monday. "As is known, in this sphere Russia has indisputable advantages and we need to maximally use them. First of all, the orbital remote sensing satellite grouping needs to be built up," the Russian president said. 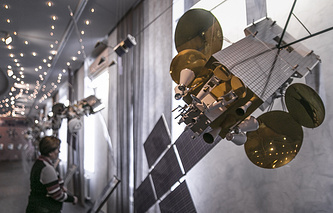 "By 2020, it should comprise no less than 15 satellites," Putin said. This measure will allow making a survey of Russia and the entire globe, the head of the Russian state said. Putin said that the technology of the Earth’s remote sensing was widely used throughout the world. The Russian leader urged to use it more broadly in Russia as well as it would also help strengthen national security, develop the economy and the social sphere and raise the quality of state governance. As the Russian leader said, the data obtained through the Earth’s remote sensing were extremely important for such sectors as construction, infrastructure, forestry, agriculture, the environment, meteorology, mineral resources extraction, the prevention and the elimination of the consequences of emergency situations.